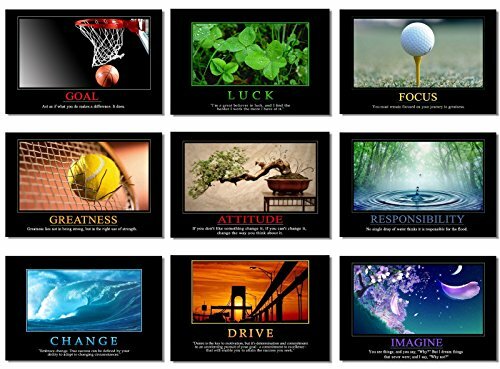 9x Poster Motivational Self Positive Office Quotes Inspirational Success Teamwork Dream Focus Responsibility Prints 20x13'' (50x33cm) E397(01-09) by Smart Wall Station at HoldUp Art. MPN: 9xPcs-T-E397(1-9). Hurry! Limited time offer. Offer valid only while supplies last. 9 Pieces Individual 20x13 inch (50x33cm) New and packed in rolled in the tube. Material: Fabric Cloth (costly than paper poster not easy destroyed). 9 Pieces Individual 20x13 inch (50x33cm) New and packed in rolled in the tube. If you have any questions about this product by Smart Wall Station, contact us by completing and submitting the form below. If you are looking for a specif part number, please include it with your message.